You know I like a deal, and I know y'all do too. Not to mention it is hotter than hell out there and we all need some fashion staples to beat the heat. I for one have been digging dresses and rompers for this Summer season and if it were socially acceptable, I would be rocking the romper at work. True story. For those of you who are acquainted with me, know that my last name is Dress. It would only be so appropriate for me to be donning one. Amirite? Here are some dresses that I have added to my repertoire recently and you should too. On the cheap. Who can resist a romper? Seriously. Pair it with some wedges or platform heels, and you have an outfit for a night out. I am totally digging it. My newest obsession has been shades. I am constantly on the lookout for new pairs. I am also considering rocking these at work. Disguise? Maybe. And last but certainly not least, the wedge. I am all about the heels people. I am that girl that you see on the weekends running errands in wedges. Not because I am short (I am 5'7) but because I adore a heel. And also, I have worn heels so consistently now that I have messed my feet up. That is right, hurts to wear flats. Sigh. A wedge is a good compromise between the flat and the heel. Rock it. I bet youre darling in any of these.. Love the tortoise glasses, and lower those hems and heels for this ol lady! but LOVE the styles. love all of your picks esp the bird wedges... so fun! 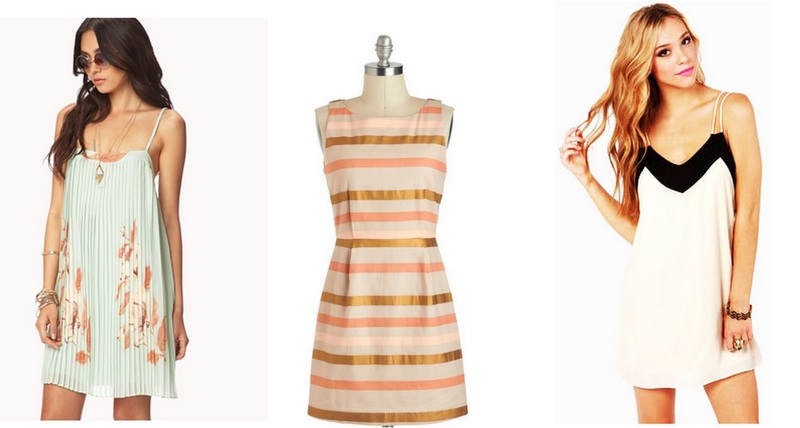 I have had my eye on that pleated F21 dress...so cute! There is really no excuse not to look so cute all summer long at these prices!! I love your eye for style! The amount of summer sales going on right now is insane. Every.where. I.look. Those rompers are amazing. Need them all! I'll wear any romper any day of the week. Also loving that pleated swing dress!! Cute cute cute! I have an obsession with sunglasses. I'll go check those out. Yes honey, in Misery...I mean MISUOURI, it's gettin hot in heeeeerrrrrrreeee! I love me a good romper. Easy peasy. So darling; rompers are for cuties like you though Lindsay! Love ever single thing here...especially the dresses, they all look so effortlessly chic. I need y'alls help. Desperately.